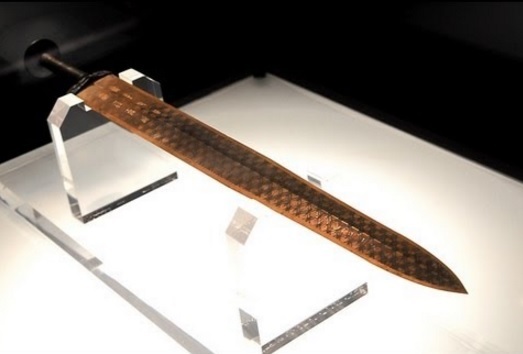 The Sword of Goujian is an archaeological artifact of theSpring and Autumn period (771 to 403BC) found in 1965 in Hubei, China. Forged of copper and tin, it is renowned for its unusual sharpness and resistance to tarnish rarely seen in artifacts so old. This historical artifact of ancient China is currently in the possession of the Hubei Provincial Museum. In 1965, an archaeological survey was being performed along the second main aqueduct of the Zhang River Reservoir in Jingzhou, Hubei, more than fifty ancient tombs of theChu State were found in Jiangling County. The dig started in the middle of October 1965 and ended in January 1966.